Arboretum is sharp enough to cut flesh, and it will. It’ll cut through you like a wooden knife. Like – a really tough knife that’s been treated. Made of old, gnarled wood. Wood that – look, it doesn’t matter. Arboretum is sharp both in terms of design and the experience it delivers to those that play. We gave it four stars in our review because it’s a damn good game. Is it a game you can play though? Olive yew will soon find out if you can or can knot. No pecan ahead, now – willow you please behave? Sorry, I’ll stop – even I’ll get sycamore puns. Each card too comes with the name of the tree imprinted upon the bottom. This is a little difficult to make out at a distance such as when eyeing up an opponent’s arboretum with the requisite sense of dread and possibility. The issue of colour is more likely to be an intersectional issue than it is a specific thing related to colour-blindness by itself, and we’ll talk about it a little more in the appropriate section. We strongly recommend Arboretum in this category. As is common, Arboretum is likely to be entirely impossible to play when considering issues of total blindness. It’s a card game with absolutely zero tactility. Even if someone is willing to support another player with reading and interpreting cards there is so much game state spread out around the various different arboretums that play is going to be exceptionally difficult at best. 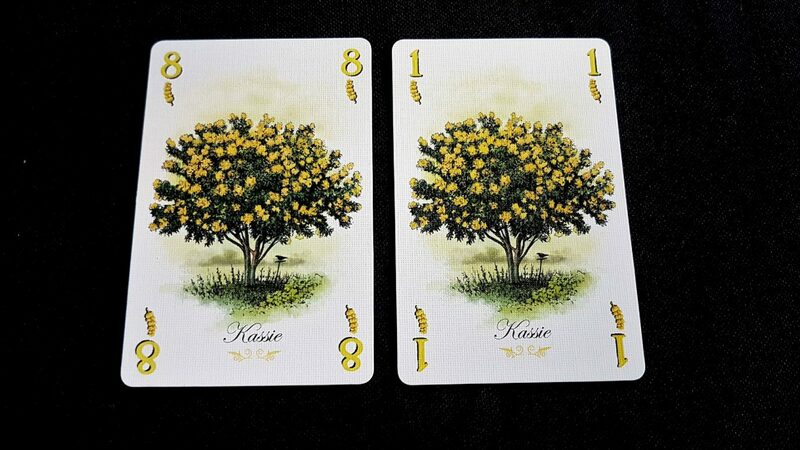 Consider for a two player game that you’ll need to assess your arboretum against an opponent in considerable detail – up to the arrangement of paths, the numerical values on each card and the order in which they were placed, and the different possible routes for scoring a player can take through their grid. For three players, it becomes an exponentially greater challenge because you’re not just adding a comparison between your arboretum and the third player, but also between the second and the third. Knowing what is wise to play is a function of appreciating the likely motivations of everyone around the table. This extends to discard piles – knowing the composition of these is vital to successful play. Visual sprawl is significant, and is going to be an increasingly significant issue as the severity of impairment increases. You can certainly quiz people on the composition of their arboretums – the information isn’t secret and your inquiry isn’t necessarily information leaking – but verbal explanations of grid-based data sets is always sub-optimal. The grids at least only ever grow – they never change what has been there in previous rounds. The cards are nicely designed for the most part – they make use of large, vibrant art that differs in both visual silhouette and colour scheme for each category of tree. If investigated with use of an assistive aid they’re likely to be fully possible to differentiate. The numbers are large and well contrasted, for the most part, against the white of the background. The text on the bottom is unnecessarily ornamented and likely difficult to read, but there are only eight kinds of trees and you’ll eventually build familiarity with what they’re called. There are no other components in the game, so as far as can be expected the cards themselves are reasonably accessible. It’s the nature of gameplay though that is going to be a problem – so much intricate relationship between competing arboretums, and so much visual sprawl, set against a game that itsintensely, viciously competitive. We don’t recommend Arboretum in this category. We discussed in the review how intensely difficult that discard phase can be, but that’s easily moderated by increasing the number of suits available for players. Arboretum is something like a knife-fight in an elevator – you’re all getting in each other’s way because there’s no space to manoeuvre. By adding in some extra trees to choose from, there’s a greater amount of breathing room. This simple change hugely impacts on the difficulty of play. 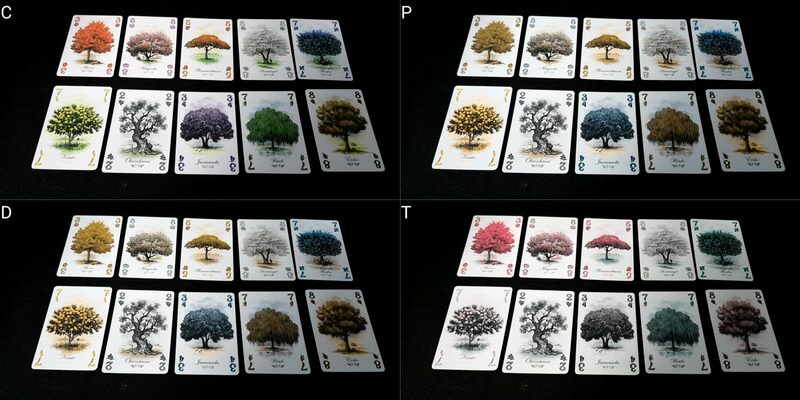 The cognitively accessible variant of Arboretum then is more generous with its decks, eliminates contention over scoring (which is where the need for furious, aggressive calculation is located), and gives everyone points based on their paths, rather than what’s left in their hand. The numeracy associated with scoring can be handled by another player if arithmetic is outside the scope of an individual’s capability. Is that a fun game? I don’t know, but it’s certainly a variant that would be feasible enough to be worth trying. I do think though you probably lose so much of the experience that you may as well play a game that is more inherently cognitively accessible. I wouldn’t though necessarily think the enterprise was doomed to failure. Well, that’s a half-hearted endorsement of a variant. Tread with caution, I guess. Really though the loss of scoring contention is significant because it’s what gives Arboretum its bite. To include this though is to seriously ramp up cognitive costs across both categories of impairment. First of all, contention over paths introduces a need to consider risk versus reward as well as the explicit numeracy of arithmetic and comparison. The variable value of an eight too shifts as the corresponding one is played or hidden. The diminishing deck hides important cards with a moderating probability, and players need to understand the point at which the mathematics change. To begin with, the cards you need are probably in the deck. As time goes by, they’re probably in the hands of other players. The extent to which that tipping point guides play will inform success. The high consequence of scoring then puts an emphasis too on players to carefully track what’s in the discard piles as the cards enter and leave. You never lose access to cards that have been buried under others, but the value they have at the time they’re thrown away may not be the same as what they have in later phases. You might find it’s worth digging down into a discard pile in certain circumstances. You also need to know what’s still floating around the game like a wasp ready to sting. If someone discarded the one of a particular suit and you have the eight, that’s a very different scenario to you having the eight and no idea where the one is. The more players involved, the more difficult this tracking becomes both in terms of sheer cognitive processing as well as the ongoing and increasing memory burden. Overall, we’re prepared to offer a very tentative recommendation here working on the assumption that the accessible variant we discussed will be the core of the experience. If you’re playing it with the rules as written, we’d strongly recommend you avoid Arboretum. Oh wow, this is a mean game. So mean that it creates a whole mess of problems here. Let’s iterate over them. First of all, the game has a central challenge that is brutal – not because it’s a complicated game, but because it’s so tightly designed that you never really want to discard anything from your hand and yet you always must. You will often be choosing between a set of equally unpleasant options, knowing every single one of them is going to disadvantage you and advantage your opponent. You need to keep cards you won’t play, because they’ll determine scoring in the future – and if you hand them away, you also hand away the chance to score. Arboretum grabs your hand, whacks you in the face, and asks ‘why are you hitting yourself?’. That in itself creates the context for extreme frustration and despair, and you can only rarely say ‘Oh, I made a mistake’. Essentially what you do is give away an excellent card because all your other ones were also excellent. That’s nice as a game system but it requires emotional control to deal with. The game doesn’t explicitly require lying or bluffing, but it certainly benefits from the ability to do both. You’re trying to convince people to make paths they can’t score, while ensuring they don’t collect the cards that can score the paths you create. We discussed in the review one way you might do this – feeding out a tree type in dribs and drabs full in the knowledge you’re wrecking someone’s arboretum. That’s a fair strategy, but it’s hardly one likely to endear you to anyone around the table. Doing that requires a bit of bluffing – you can’t make it too obvious that you’re laying a trap. The game itself helps you in this, because as mentioned above it’s entirely possible you’ll be repeatedly giving your opponents good cards because that’s the only option you have available to you. As such, the cues that go along with bluffing are going to be hidden in a miasma of plausible deniability. If reading social signals is already a problem, Arboretum intensifies the challenge. The nature of scoring too – yeesh. You look someone dead in the eye, over the beautiful arboretum they spent half an hour constructing, and say ‘You don’t get any points for that’. And they look at you and see you don’t have any of the tree to score either. They know that you explicitly kept cards to deny them points. There’s no ambiguity here – no ability to say ‘Oh, I only did that because it was my best move to progress my own arboretum’. You kept cards to stop them scoring to no direct benefit for yourself. Indeed, it normally comes at a cost to your own arboretum’s development. You’re pure evil. You’re some kind of horrible devil monster. Then, these three factors converge to create potentially staggering score disparities. 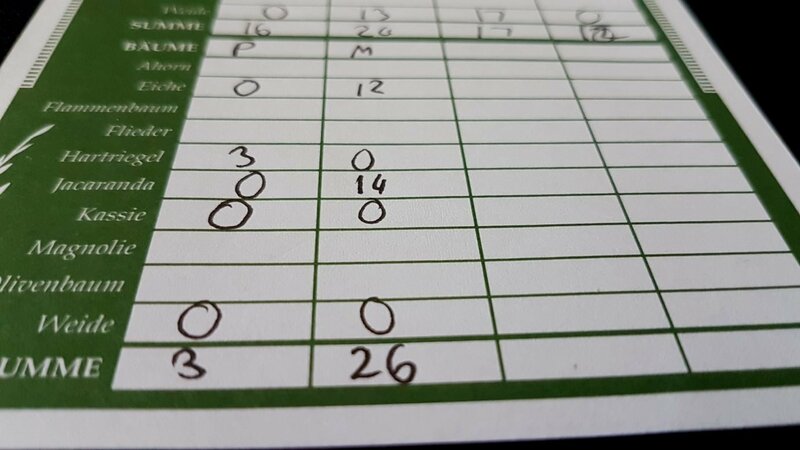 Would your group deal well with a score sheet like this? You better hope so, because you’ll see them pretty often. That one above is completely made up. Here’s a real one. We had another tree, but none of us had planted any. This is the game I talked about in the review – this is the game where I fed trees to Mrs Meeple purely to make her ruin her arboretum. Not only is the score disparity considerable, the emotional differential is massive too – a score disparity that came about through an opponent’s explicit prevention stings quite a bit more. It’s not even as if you can shift gears during play if you realise what’s happening – by the time you understand the trap that’s being set for you it’s already too late. You can’t really afford a bad turn in Arboretum, and you certainly can’t afford a half dozen of them. You can’t say ‘Oh, I’m going to replant all of these’ – instead, you have to live with the mistake writhing through your plans. To progress one path, you almost certainly sacrificed cards for another. The competition in Arboretum is pungent, and you absolutely need a group that can deal with this kind of explicitly engineered nastiness. As a more minor note, it’s also a game that is about patterns but not about necessarily completing them. Certain kinds of obsession conditions may find paths comprised of varying trees and skipped numbers something of a frustration. We strongly recommend you avoid Arboretum if emotional accessibility is at all an issue within your groups. 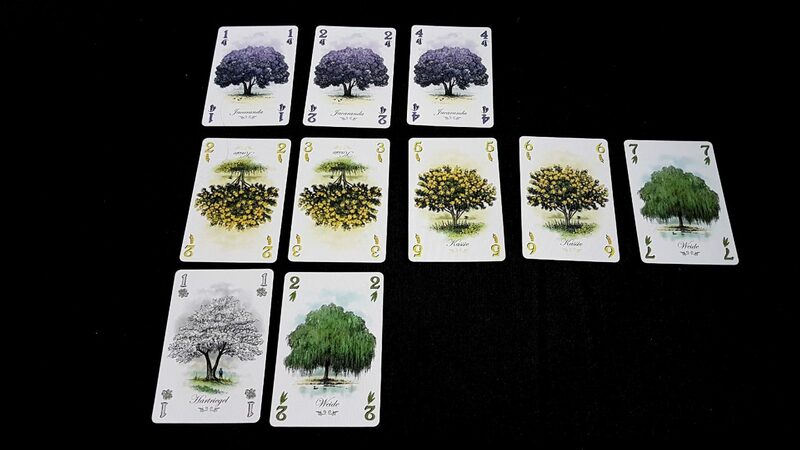 Arboretum will be easy enough to play with the use of a standard card-holder – hand sizes range from between seven and nine but they won’t grow bigger or smaller. During your turn, you’ll have nine and then seven once more, and the rest of the time only seven. If players are able to hold and play cards into a grid in front of them, that part of the game won’t be a problem. There is sometimes a degree of physical sprawl that accompanies the game, but it rarely goes beyond about four or five cards away and you get to decide yourself the extent to which to permit it. Some placement strategies will impact upon this, but there’s no difference in that respect from breadth-wise and height-wise positioning. If the direct card-play itself is not possible, verbalisation is entirely feasible. Each card is uniquely identifiable, as in a standard playing deck, and a simple convention of ‘up, down, left, right’ or even ‘north, south, east, west’ will serve to uniquely position a card. ‘Take card three from my holder, position it left of the four of Magnolia’, as an example. 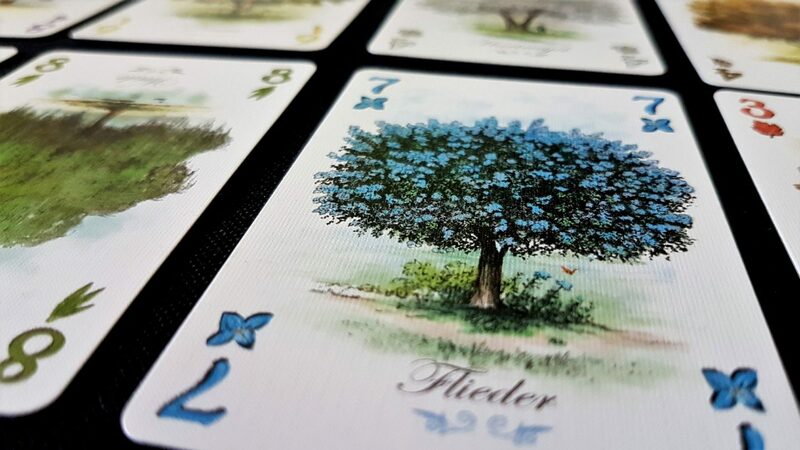 The cards do have tree names on them, but as you can see from our review we play it with the German language edition and it is fine – the graphical design by itself is enough. Otherwise, there is no formal need for literacy or conversation. You can play it in awkward silence which is handy – you might not want to talk to anyone around the table ever again after. The manual doesn’t default to masculinity, and alternates pronouns throughout. The game makes use of no gendered art – it’s all just lovely, lovely trees. Cost wise – well. The English language version of this is, at the time of writing, out of print. Don’t be fooled by the £100 and £150 price-tags you’ll see on Amazon – those are being sold by price gougers. The German version is one I picked up for £13 and at that price it’s worth every penny without question. While you do need to download an English manual to go with it, that’s easy enough to do and what German is present is easily handled with a crib sheet. It’s absolutely fine here to go with a foreign language edition if you can’t get it in your native language. Presumably though a reprint will be available at some point, but the game is published by Z-Man Games and historically they have dragged their feet considerably in this area. They’re owned by Asmodee now though, so perhaps that’ll change. Anyway – certainly don’t pay the inflated prices for it, but at its usual RRP of £15 I would say it’s a bargain. It plays well at all player counts, but it does top out at four – you’re not paying much per player, but you won’t find this fit especially well as an entry in larger gaming nights. It does fit into other scenarios though like a finely oiled lockpick into a keyhole. Those with an intersection of colour blindness and visual impairment may find that the trees are not quite distinctive enough to offer full differentiation. Since we don’t recommend Arboretum for the visual accessibility category all that would do in this case is strengthen our view. Similarly when dealing with the intersection of visual and physical impairment – even relatively minor visual impairment may require players be able to closely inspect other arboretums, either through questioning of players or with an assistive aid. For the former, this would be a problem if a communication impairment must be considered, and for the latter the amount of sprawl may create a complication. If playing Arboretum with verbalisation, there is the usual concern that a communication impairment may render the game difficult to play unless a suitable convention can be arranged. There isn’t a great deal of communication required though, so this shouldn’t be an overly difficult issue to work around. Games of Arboretum last around thirty minutes for a full set of players – perhaps a little longer, depending on the extent to which people are growling at the cards in their hand, but somewhere in that vicinity. As such, it’s short enough that it likely won’t exacerbate issues of discomfort. It’s not a game though where dropping out is going to be possible without serious game impact – cards never recycle back into the common supply except through the inexorable drum-beat of discard. When cards are placed, they’re gone from the supply – even if hand cards are distributed back into the central deck, a certain degree of damage has been done to everyone simply as a result of the partial placement. If those too are distributed back into the deck, it’ll throw off the rhythm of play and undermine whatever strategies people have been working towards. It’s fine if someone can take over, but not quite so good if someone must simply drop out of the game. I’ve emphasised this many times in the teardown and the review but bear in mind this is a pointedly nasty little game – hyper competitive titles like this always make me a little uneasy because accessibility at the table is in many ways a communal task. When games are at the pointy end of competition, it disincentivises people from making reasonable adjustments for accessibility. That’s especially true here when you’re actively looking to trip up your opponents and lead them into making mistakes. This isn’t going to be an issue for every group – many groups can be intensely competitive and still collegiate – but it’s something to bear in mind. This game really isn’t for everyone. 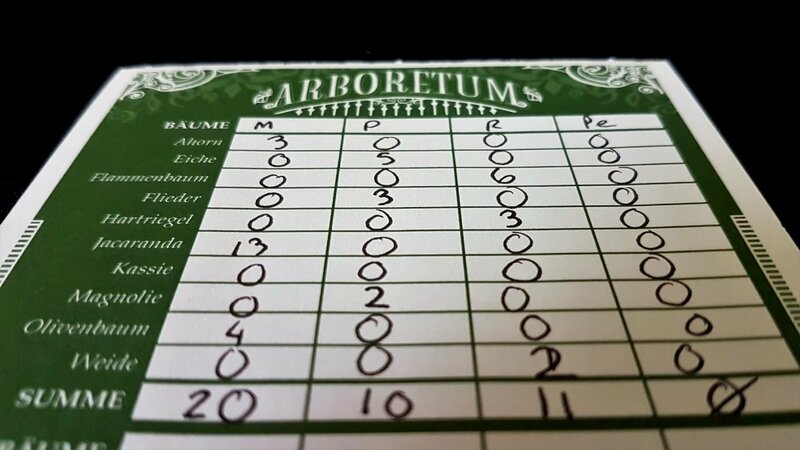 Arboretum is perhaps the meanest game we’ve looked at on Meeple Like Us – the scoring system is psychologically invasive. It’ll get all up in your nooks and crannies, and that has a significant impact on many elements of the game. However, hidden in this marcescene minefield is a very charming little game of simply laying trees – one that might, if you strip back the satanic scoring system, address a number of the key issues we have identified here. We certainly wouldn’t recommend our cognitively accessible variant as a solution to the emotional accessibility issues – after all, that variant explicitly isn’t Arboretum. We think though there’s probably enough enjoyment to be had there to be willing to tentatively recommend it in a couple of categories we otherwise wouldn’t. 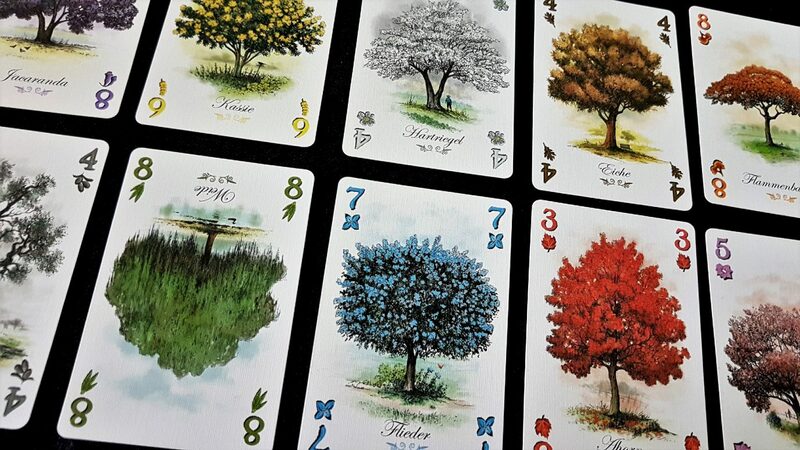 We liked Arboretum enough to give it four stars in our review – it’s a gorgeously tight game with equally gorgeous art, but it’s a bit like playing catch with a tamed but ferocious predator. It’s lovely to look at, fun to play with, but it’ll snap your neck like a twig if you aren’t careful. You only spend thirty minutes building these arboretums, but the sting of the scoring system will likely stay with you a fair bit longer. Still, if you think you can handle that it’s a tremendously worthwhile game that will give you a lot of mean-spirited pleasure.